In the face of growing land use change, resource scarcity, and degradation we recognize dominant negative attributions. The international scientific discourse on land use change is dominated by publications on negative human impacts like “losses” and “destructions”. Loss of biodiversity, loss of carbon stocks, degradation and deforestation drive the contemporary debate. Humans increasingly change the ecosystems they are living in. Land use change is thus a highly relevant and widely discussed issue, both in scientific and societal debates. It has become an important international research field and is addressed explicitly in one of the Sustainable Development Goals (SDGs), set out by the United Nations within the Agenda 2030 (Sustainable land use - Goal 15: Protect, restore and promote sustainable use of terrestrial ecosystems, sustainably manage forests, combat desertification, and halt and reverse land degradation and halt biodiversity loss). However, there is also reason to believe that anthropogenic land use change can have positive effects on both, human well-being and sustainable ecosystem developments. For instance, traditional land use in temperate regions has led to an increase in biodiversity with its associated functions. Against this backdrop, this research aims to contribute to a change in the dominant perspective, thus initiating a new paradigm in the debate by focusing on forms of positive impacts through land use change. Different scientific disciplines can help to open perspectives in this way. Positive impacts through land use change can be explored e.g. from ecological and paleoecological, archaeological, environmental economical, human-geographical, political as well as psychological science. For instance, through the different perspectives, varying definitions of the normative term “positive impacts” can form a more holistic, interdisciplinary picture on impact assessment. Firstly, we identify temporal and spatial exemplifications of positive land use changes. For instance, in “young domesticated” landscapes - with close-to-nature ecosystems - human interventions have a negative impact on biodiversity (fragmentation). In “old” cultivated landscapes, on the other hand, the preservation of biodiversity is linked with the preservation of land use diversity (and old usages). We reflect the idea that there are positive aspects of land use change over space and time. This consideration can be substantiated by exploring the world wide cultural landscape development in a comparative way. In Europe, it is common that “human” and “environment” are thought together (land sharing) due to land use that goes back millennia. 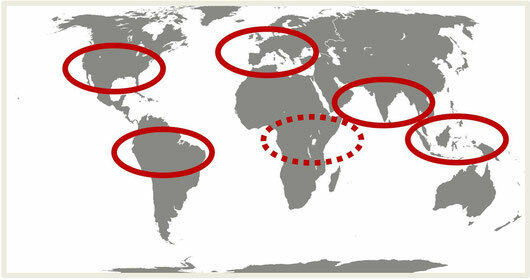 In contrast, in the western hemisphere (North and South America, which is still coined by dynamic deforestation), “human” and “environment” are frequently treated separately (land sparing). In this regard, advantages and drawbacks should be exchanged. Secondly, solutions for sustainable land use are usually discussed in an either-or manner, e.g. land sharing vs. land sparing. Preferably a diplomatic solution is presented representing the optimum between all tradeoffs multiple disciplines are aware of. Our considerations reach out to the hypothesis that one optimal solution would lead to a less diverse globe. Counterintuitive we argue that a diversity of land use options including extremes derived from a monodisciplinary aspect are needed to preserve both biodiversity and cultural diversity. Overall the best mix of solutions has to be regionally tailored under consideration of national and global pattern. That means, solutions can range from small scale diverse land systems to large scale mono-structural land system. Therefore we propose to develop a catalog of single disciplinary solutions based on context, scale and time preferences. Thirdly, combining insights from different disciplinary perspectives, we hold that positive motivation leads to an optimization of land use. Biodiversity, as well as cultural diversity, are mainly considered as goods of common interest inheriting high values that need to be protected. Interaction between the both, however, are perceived among the fundamental clashes between man and nature and peaks in land use. Therefore, the focus should be on positive aspects: different landscapes fulfill different ecosystem services and contribute to different SDGs. Through supra-regional agreements, it can be ensured that all functions of ecosystems are sustained (or improved). The prevention of similar landscapes and biodiversity losses requires transdisciplinary solutions. Together with stakeholders from different thematic fields (nature conservation, agriculture, forestry, landscape planning, climate protection etc.) as well as different spatial and planning levels, the new co-design project “More land use diversity -regionalize it!” aims at developing perspectives and strategies for a sustainable land use (Sustainable Development Goal (SDG) 15). Extreme solutions like deforestation should not be excluded in these strategies. The project group will develop different land use scenarios for the model region of “Baden-Württemberg” and will discuss them with relevant stakeholders. The new insights of the project shall be concluded with a research agenda that will describe the open research questions. Together with colleagues from different scientific disciplines (forestry, economy, ecology, human geography, politics, psychology, modelling) we prepare an application for a Research Unit at the DFG.